After the hostile reaction from critics and fans caused by The Phantom Menace, George Lucas reassured everyone constantly that the follow-up, later subtitled Attack of the Clones, would be much, much better and would satisfy audiences much more than the previous film did. The second in Lucas’ prequel trilogy is, out of all six movies thus far, our least favourite. This is due to many things, whether it’s the wooden acting that’s somehow even less convincing than in The Phantom Menace, the terrible dialogue and screenwriting by Lucas and co-writer Jonathan Hales (who, upon looking at his IMDb page, hasn’t really gone on to do anything else other than a few Young Indiana Jones shorts; it’s sad, when you think about it), or the far-too-long running time which, at 142 minutes, makes it the longest Star Wars movie to date. For us, though, it’s the over-excess of computer-generated effects that are placed all throughout the movie that makes this film rank the lowest in the series filmography. Keep in mind, this was a time when CGI was becoming used more and more to create the kind of locations, characters and scenarios that would have been all but impossible to film practically, so Lucas – who envisioned a future where digital would slowly but surely succeed film, and also partially came true when you look back over the past few years of cinema – decided that this was all he needed to make these worlds, these environments, these creatures etc come to life. Unfortunately, it ended up backfiring in his face because it makes everything in this movie look like either an extended PS4 cut-scene from Star Wars: Battlefront, or a cartoon that not even the later animated series Star Wars: The Clone Wars could pass off as one of its own. It is everywhere, and you can tell from the increasingly fake-looking backgrounds with these clearly confused actors acting opposite a blue-screen without much sense of what they’re even looking at, to the needlessly CG-ification of classic characters (okay, we understand making Yoda a CG character, but C-3PO?! Even Anthony Daniels doesn’t sound that impressed as he returns to voice the classic robot butler character). It all just looks way too fake for us to be truly invested, and if anything it should serve as a great example to film students about the dangers of over-excess with CGI in film, even Star Wars. Everything we see may be fake, but that shouldn’t also mean that the real actors should be just as lifeless either. Lucas continues to show his un-enthusiasm as a director throughout this trilogy, and it comes across in the many performances here from good actors like Ewan McGregor, Samuel L. Jackson and the late Christopher Lee. Of course, we all know about Hayden Christensen’s infamously bland performance as Anakin Skywalker here, and for the most part those criticisms are entirely justified, but people seem to also forget that Natalie Portman is just as wooden here also (don’t worry, she went on to make Black Swan and win an Oscar, but here it’s easy to see why she’s not as warm to the films as others might be). Both her and Christensen’s romantic chemistry is about as passionate as a turd in a sink, and their now legendary romantic banter wherein he goes on about his dislike for sand amongst other things is unintentionally funny when you think of the hours that Lucas and Hales spent writing this film and stuff like “I am haunted by the kiss you should never have given me” is the best they could come up with. However, even if you took out all of the rubbish dialogue and unconvincing romance, the film itself is just a bore. Admittedly, there isn’t as much political jargon as there was in The Phantom Menace, but with the amount of exposition and almost non-existent character development here there might as well be; nothing is less engaging than coming to all these fascinating worlds in this diverse galaxy, and then spending most if not all your time listening to inane conversations about clone armies, republic separatism, granting emergency powers to the so-clearly-evil-why-isn’t-anyone-stopping-him Chancellor Palpatine (Ian McDiarmid) and so on. By the time the action-heavy – and CGI-filled to the brim – third act comes about, you’re too far gone from really caring about anything that happens, which is the opposite of what a Star Wars movie should be. Not everything about this film is bad, though; it’s always cool to visit new worlds within the Star Wars universe, effects be damned, and the climactic fight that shows Yoda finally getting to kick some arse is enjoyably silly (even the effects used to bring him to life aren’t that bad, in fact he’s one of the few visual effects that’s actually held up well over time). 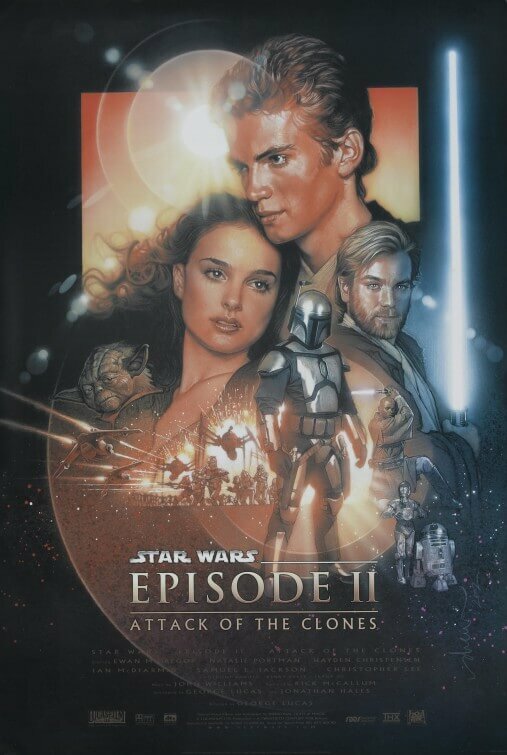 But overall, Attack of the Clones is easily our least favourite Star Wars movie because, for us, it goes against almost everything that made the series so enjoyable to begin with. Attack of the Clones is our least-favourite Star Wars movie, with an over-excess of CGI that makes everything look far too fake, wooden performances by actors given a rubbish screenplay, and an overall unexciting feel to it that leaves even the biggest fans bored out of their minds.